While enjoying some pictures on Elle Decor I came across this dining room which I find architecturally stunning. 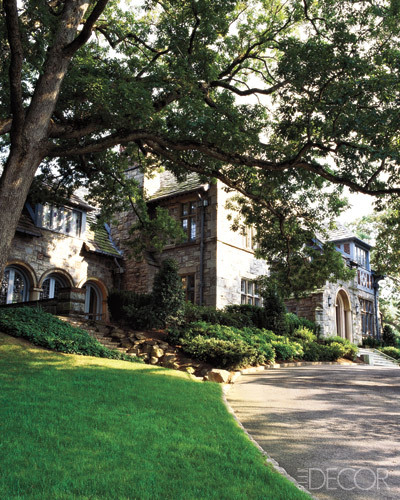 I researched further and discovered that this is the reception of a 1927 tudor in Bronxville, NY, a few miles from where I live. 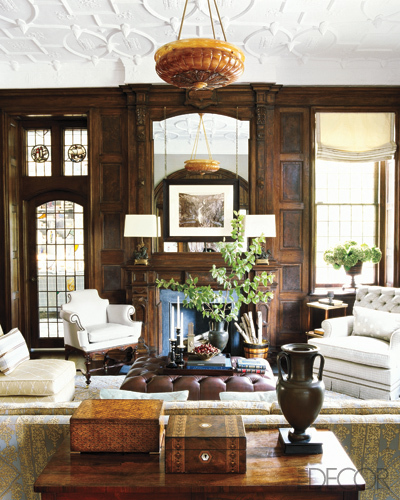 This home was decorated by designer Steven Gambrel. It has been designed with casual and modern furnishings, perfect for the homeowners, a family with three young kids. The reception has been converted into a dining room. It has the original staircase and a magnificent ceiling. The chandelier is vintage, dining table is English from the 1930s, carpet is 1920s Persian and the chairs are of cowhide. Elegant library with comfortable seating - I love the deep sofa -which is not stuffy, and great windows. 1895 Swedish ceiling light; original-to-house built-in bookcase. Oak panelling in the library is also original and was completely restored. One of my favorite spaces - the second floor hallway - with this stunning artwork which makes a bold statement. 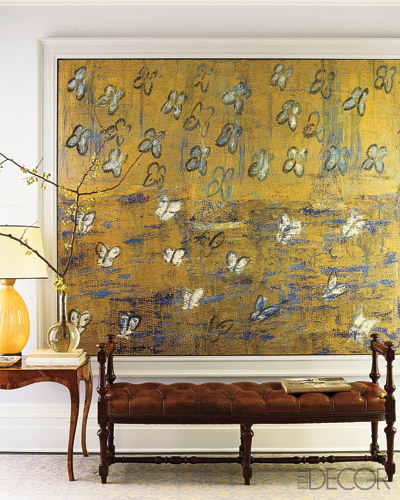 The painting is called Golden Butterflies and is by Hunt Slonem. Antique English bench and vintage European table and lamp. Another amazing space with a magnificent ceiling. The foyer with ABC Carpet and Home runner, lamps made from 19th century French urns, antique light, vintage console. Furniture in the family room by the designer. I love the painted doors here. Vintage lighting. The sunroom has the original French doors and coffered ceiling. Furniture is by the designer and rug is custom-made whereas lamps are from the 1950s. Marble countertops and custom cabinets in this great white kitchen with vintage light fixtures. The coffered ceiling is new. I love the use of blue and green in this guest room. The master bedroom boasts a custom headboard, antique bench and 1920s French chandelier. Do you like the overall feel of this home? I think the designer was very successful in giving the homeowners a relaxed, comfortable and modernized home without compromising the overall aesthetics of the original 1927 tudor. Which is your favorite room?